Continuing my habit of adopting trends five years after they are in fashion, I’ve started a linkblog. It’s over there in the right sidebar (—>), and the xml feed is available here. I enjoyed the fact that yours was one of the few blogs without the throwaway link blog. You write excellent blog posts, isn’t that enough? Just don’t loose the yeti pic. I’m thinking of upgrading to Vista in 4.8 years. Come play in my caption contest! Please? I’m waiting a couple more months before I put a high school pic on my blog. Hey, I’m from Idaho – I have to wait at least a year to start following trends. I don’t see anything? What’s a Link Blog? Anyone else having problems clicking through from the RSS feed. The feed shows up great in Google Reader, but the links are directing correctly. It may just be a problem on my end, but I figured I’d see if there’s anyone else who’s experiencing this. I’m having problems clicking through from Google Reader, as well. When I try to do so, I am directed to a page with a 403 error. The feed doesn’t have a link to the actual site dy is pointing out, it has a link to the individual linklog post (i.e. http://www.defectiveyeti.com/dylinkblog/2007/03/bakers_edge.html) which we can’t access. And it is now fixed! Fantastic! 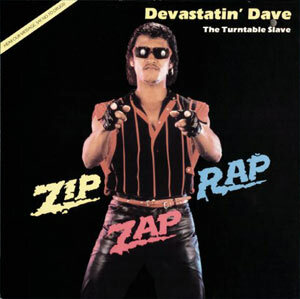 Loved the Top Ten Worst Rap Album covers, but I have to say: no such list is complete without a nod to Zip Zap Rap by Devastatin’ Dave. He is a Turntable Slave, yo.